There are numerous ways to craft applications for different mobile devices, each having their own advantages and disadvantages. 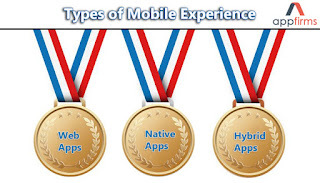 Generally, there are three basic types namely, mobile websites, native apps, and hybrid apps. Mobile websites are apps which function well on a mobile device but are usually accessed through the mobile browser. Sometimes they are called web applications. In simple terms, they are websites viewed on a mobile device browser, with the exception of being created to fit a mobile device screen size. This is what we call web responsive design. Easy maintainability, easy to update without the urge to go through an approval process. Native applications are created using the default language for the said mobile platform, which is Java for Android and Swift or Objective C for iOS. Native apps are compiled and implemented directly on the device. Using the SDK Platform (API), the app can interact with the platform to access device data or load data from an external website. Both Android and iOS offer a set of tools to allow developers to make use of the platform features in a systematic manner through predefined APIs. There are both official and unofficial tools, which can also help in the native apps development. Native APIs can be used directly in the app, making the strong connection to the platform. Native apps enjoy highest levels of performance. Helpful for developers familiar with the languages used. A hybrid application is a mobile app which contains a web view to run a web app inside of a native app, using a native app wrapper which can interact with the native device platform and the web view. This means web apps can run on a mobile device and have easy access to the device, such as the GPS and camera features. Hybrid applications are feasible because of tools that have been created that smoothes the interaction between the native platform and web view. These tools are not associated with official Android or iOS platforms but are actually third party tools like Apache Cordova. When a hybrid application is developed, it will be compiled, converting your web app into a native app. You need to build your app once and deploy it to multiple platforms with nominal effort. This enables you to develop mobile apps using the same skills that are used to develop websites and web apps. As the web view is covered in a native app, your app has access to all features of the device available to a native app. Hybrid apps are fast and easy to develop, without the requirement to frequently rebuild to preview. Plus, you have access to the same development tools that are used for building websites. All these different applications have their own importance. Considering this fact, we at AppFirms are creating a community of developers who are well-versed with the above mentioned platforms and are capable of delivering quality results as per the client’s requirements.